Venezuela Sets Date To Elect Chavez's Successor : The Two-Way Venezuela's elections commission announced Saturday that voters will go to the polls on April 14. Henrique Capriles, who opposed Chavez in the last election, is expected to face interim leader Nicolas Maduro. 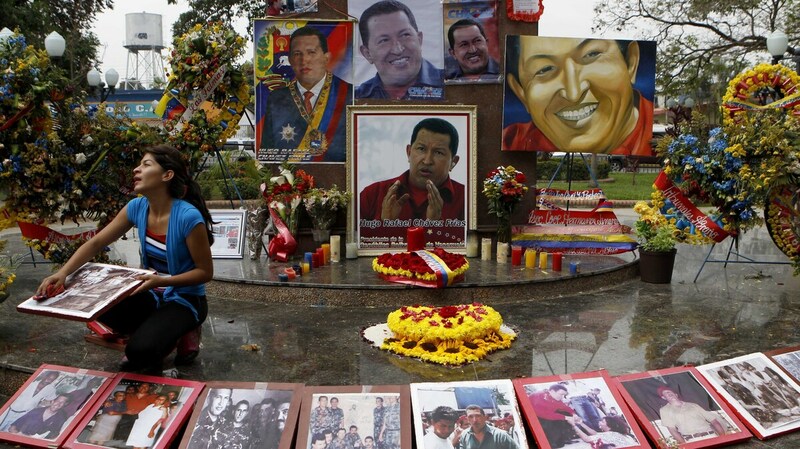 A woman wipes photos of late President Hugo Chavez at a makeshift altar for him in the main square of Sabaneta, western Venezuela, on Saturday. Venezuela's elections commission announced Saturday that voters will go to the polls on April 14 to choose a successor to President Hugo Chavez, who died this week after a battle with cancer. The nation's constitution mandated that an election be called within 30 days of Chavez's death on March 5, but the scheduled date falls outside of that window. Nicolas Maduro, Chavez's vice president, was sworn in as interim leader on Friday. Opposition coalition leader and state governor Henrique Capriles, who ran against Chavez in the October election, has disputed Maduro's right to be interim leader. Capriles is expected to be the opposition candidate against Maduro in the special election, though many in his party are concerned about the vote's fairness. In the days leading up to Chavez's funeral on Friday, mourners paid tribute to the former leader known for his boisterous leadership and outsized personality. Following in the footsteps of other leaders like Vladimir Lenin, Josef Stalin and more recently North Korea's Kim Jong Il, Chavez's body will be embalmed and put permanently on display, Maduro said Thursday. Chavez has been compared to other Latin American revolutionary figures like Simon Bolivar and Fidel Castro, but Argentine journalist Andres Oppenheimer told weekends on All Things Considered host Jacki Lyden that there are also parallels between Chavez and Juan Peron, Argentina's former president, who was first elected in 1946. "Like Chavez, [Peron] was a military man; like Chavez, he was a coup plotter," Oppenheimer says. "He [also] was elected president and benefited from a huge commodity boom and started giving away money to the poor." Chavez is credited with using Venezuela's vast oil reserves to bolster other Latin America countries and bring in billions to his nation's economy. Many supporters referred to him as "the president of the poor," another trait he shared with Peron. Chavez believed himself to be the successor of Simon Bolivar, the 19th century political leader who helped Latin America obtain its independence from Spain. He dreamt of uniting all Latin America countries, something Eduardo Gamarra, who teaches politics and international relations at Florida International University, says Chavez came pretty close to achieving. "One might say that his legacy is going to be measured by whether or not that attempt to integrate Latin America will survive," Gamarra tells NPR's Lyden. One thing that is likely to survive is the idea of Chavismo, or the "cult of Chavez." Oppenheimer says you are likely to see Chavismo on the right, left and center of Venezuelan politics in the future. "[Chavez] gave endless speeches almost every day for hours at a time," he says, "and there are enough quotes by Chavez to justify almost anything. A lot of people who were anti-Chavez ... [now] proclaim themselves to be Chavistas." One of those Chavistas is Maduro, who hopes to succeed Chavez by winning the upcoming election. While crying at the funeral Friday, Maduro said, however, he has big shoes to fill.